'The Lady' chronicles the life of Burmese democracy leader Aung San Suu Kyi (Michelle Yeoh) and her husband Dr. Michael Aris (David Thewlis), with Jonathan Woodhouse (Encompass Founder and Artistic Director) starring opposite the pair as their eldest son 'Alexander Aris'. Directed by legendary auteur Luc Besson, the film is released today (December 30th) in the UK More information, images and trailers from the movie can be found at www.useyourfreedom.com. We've been given our first ever review for an event! The Residency - Live Music at Mascara Bar which took place last month was recently reviewed by HerUni - you can check out the review here! BECOME PART OF THE TEAM - CAST AND CREW NEEDED! 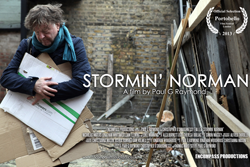 Written & directed by Paul G Raymond, Stormin’ Norman follows Norman, a homeless man living in the London suburbs. We journey with Norman through the ups and downs of his everyday life until he meets Sarah, a young woman who dares to break the routine. Labels: 2012, Aung San Suu Kyi, David Thewlis, Happy New Year, Jonathan Woodhouse, Luc Besson, Michelle Yeoh, Review, Reviews, Stormin' Norman, The Lady, The Residency, Vacancies, Who is Moloch? SHOOT FROM THE HIP! 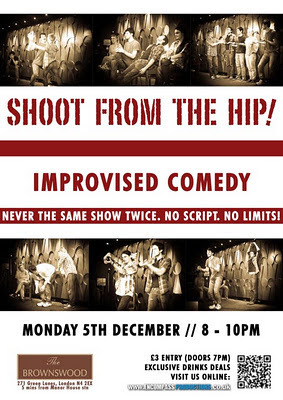 are hitting London's West End for one last time in 2011 with their weekly improvised comedy show! Everyone's favourite new comedy troupe will be at renowned Top Secret Comedy Club on Tuesday 27th December. Never the same show twice, everything SHOOT FROM THE HIP! perform on stage is completely unrehearsed and unpredictable. You give the locations, you give the characters...and remember with no script there are no limits! 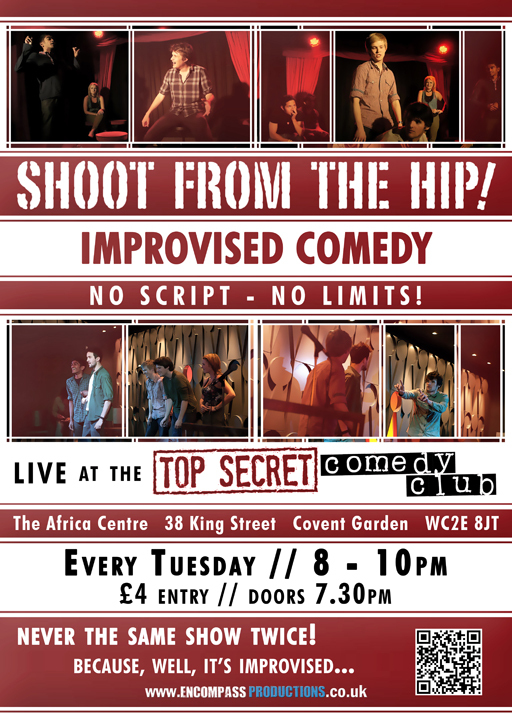 So bring anyone and everyone with you for a night of improvised chuckles to keep you warm this winter at Top Secret! BECOME PART OF THE TEAM - HELP US MAKE OUR FIRST PRODUCTION ON FILM! All positions are voluntary - professional references will be provided. Sam Holmes - Jim Stoten - Andy Barr - Phil Boothman - Guy Fletcher - SHOOT FROM THE HIP! All profits will go to 'Crisis at Christmas' which provides vital services for homeless people over the festive season and is celebrating its 40th anniversary this year. 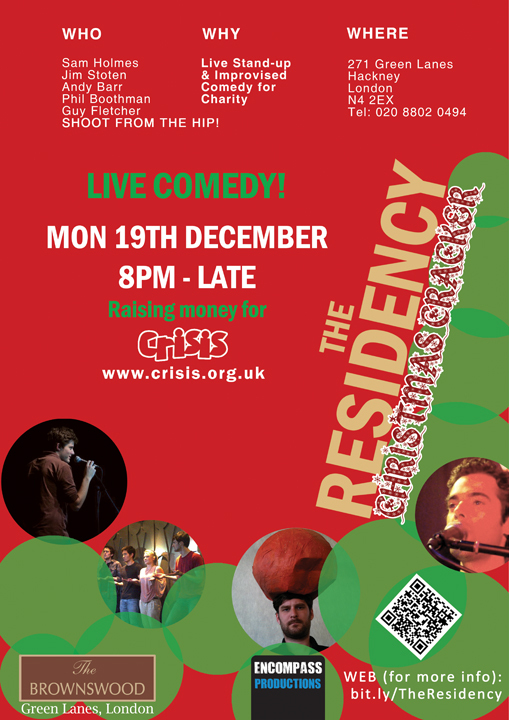 So come and join The Residency for one last time this year for a cracking night to celebrate all things Christmas...and all things comedy! After their brilliant debut last week, SHOOT FROM THE HIP! 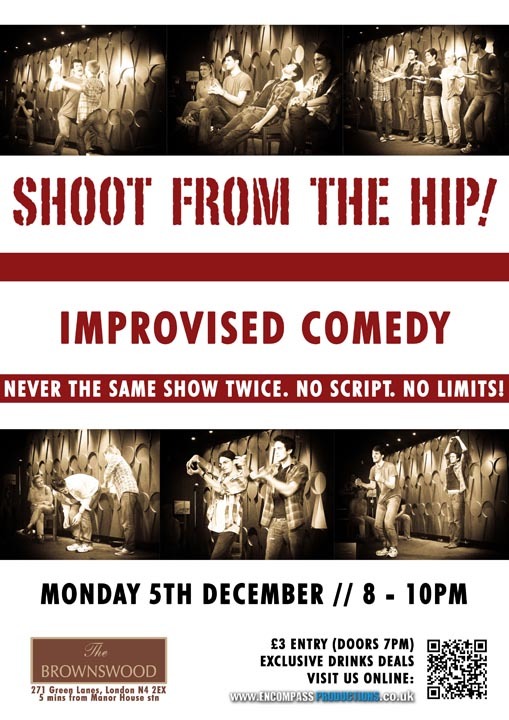 are hitting London's West End again just in time for Christmas with their weekly improvised comedy show! Everyone's favourite new comedy troupe will be at renowned Top Secret Comedy Club on Tuesday 20th December. Never the same show twice, everything SHOOT FROM THE HIP! perform on stage is completely unrehearsed and unpredictable. You give the locations, you give the characters...and remember with no script there are no limits! Founder and Artistic Director of Encompass Jonathan Woodhouse was recently interviewed by Philippine Generations on Encompass Productions, acting opposite Michelle Yeoh and David Thewlis in Luc Besson's 'The Lady', working at the Theatre Royal Stratford East and advice for those wishing to build a career in the arts. Check out the interview at the Philippine Generations website here. 'The Lady' chronicles the life of Burmese democracy leader Aung San Suu Kyi (Michelle Yeoh) and her husband Dr. Michael Aris (David Thewlis), with Jonathan starring opposite the pair as their eldest son 'Alexander Aris'. The film is released in the UK on December 30th. More information, images and trailers from the movie can be found at www.useyourfreedom.com. It's snowing at www.EncompassProductions.co.uk! Check out our website with loads of videos, pictures and information on who we are, what we do and why we're doing it! We hope to see you at our Christmas events! SHOOT FROM THE HIP! are hitting London with their own brand of off-the-cuff comedy now EVERY WEEK! Following their fantastic appearances all over London (and even winning an Improvaganza event at the Edinburgh Fringe) everyone's favourite new comedy troupe are coming to the renowned Top Secret Comedy Club every Tuesday! Never the same show twice, everything SHOOT FROM THE HIP! perform on stage is completely unrehearsed and unpredictable. You give the locations, you give the characters...and remember with no script there are no limits! So bring anyone and everyone with you for a night of improvised chuckles right in the heart of London's West End at Top Secret! All profits will go to 'Crisis at Christmas' which provides vital services for homeless people over the festive season and is celebrating its 40th anniversary this year. So come and join us for one last time this year for a cracking night to celebrate all things Christmas...and all things comedy! Encompass gave a successful talk at Goldsmiths, University of London last week on 'forming a company'. The talk was led by Artistic Director Jonathan Woodhouse and Research and Dramaturge Christopher O'Shaughnessy. "The aim was to give an optimistic but realistic idea of what it takes to form an arts company, and how to keep it going. We charted our journey so far, the ups, the downs and also talked about our process. It was a great turnout and it was fantastic to hear everyone's questions. To be told by people afterwards that they were inspired was very humbling and it means we achieved our goal." BECOME PART OF ENCOMPASS PRODUCTIONS! 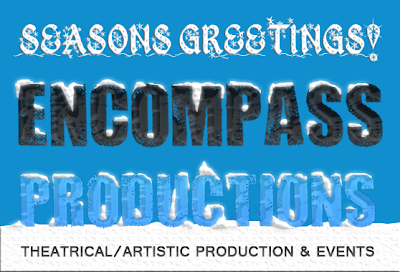 We will soon be announcing opportunities to join Encompass for our upcoming productions! We are looking for both performers and crew members to join the teams for our short film 'Stormin' Norman' and our yet-to-be-announced next theatre project! 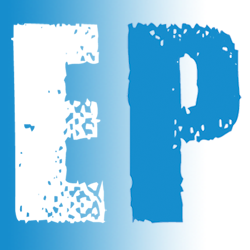 If you're interested in finding out more details, send us an email to enquiries@encompassproductions.co.uk! We hope you're able to join us at our last events of 2011 - expect more updates soon! 3 weeks of SHOOT FROM THE HIP! starting tonight! SHOOT FROM THE HIP! are hitting London (repeatedly!) in December with their rip-roaring improv comedy show! Following their fantastic appearances at The Residency live comedy events in November everyone's favourite new comedy troupe are back with their own brand of off-the-cuff hilarity, starting TONIGHT with their show at The Brownswood. Never the same show twice, SHOOT FROM THE HIP! will rely on audiences to suggest characters and locations - and with no script, there are of course no limits! So bring anyone and everyone with you for a guaranteed cracking night. The Brownswood will also have some great drinks deals on - all this for a measly £3...what more could you ask for? Be there! Of course one show isn't enough, so how about two more? We're very proud to announce that SHOOT FROM THE HIP! 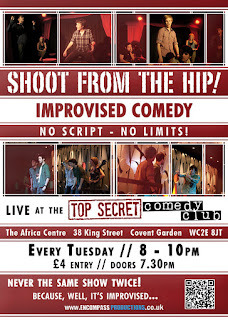 we'll be appearing every Tuesday from 13th December at the renowned Top Secret Comedy Club in Covent Garden! 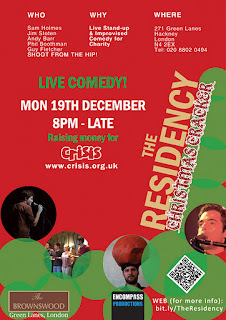 Our comedians will then be improvising their socks off at The Residency Comedy Night: Christmas Special on 19th December back at the Brownswood. The event will be raising funds for homeless charity Crisis. MORE DETAILS COMING VERY, VERY SOON!